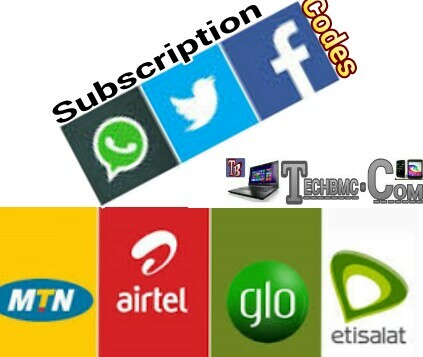 Hello Techbmc fans, Today I will be sharing with you guys latest Whatsapp, Facebook and Twitter plans activation/subscription codes for MTN, Airtel, GLo and Etisalat Networks.The codes for these various social media chat, are used to subscribe for weekly and monthly basis in order to have internet access to login and chat with friends. This days, nobody border sending SMS provided by network operators, as all now send messages on these various social media chat apps platforms, thereby replacing it with the service all this Telecom network operators provides. Will I say it’s because, it isn’t in affordable rate that make their customers to prefer using these various social media especially whatsapp and facebook, more than SMS platform. But, I have come to understand that, it is because people are now committed to these social medias for sending their short SMS. Knowing fully well that it is affordable, cheap and very fast for multiple messages or purposes, which include; sharing of videos, images, music, pdf files, Apps etc. Whatsapp, Twitter and Facebook chat apps remains and happens to be our most important apps, we use on our smart Android phones and other Mobile operating system devices. And we wouldn’t want anyone to tamper with it no matter what. Hey, are you one of those that does that? Lols. Now, talking about Whatsapp alone, that was launched in the year 2009, the officials announced that they have had over more than 5 Billion downloads from users, recording that each day, closely 1 to 2 million people register on the platform. And on daily basis, billions of messages are been sent through the platform by registered users. However, Facebook and Twitter has been there and should be recording trillion registered users. Now, by mere seeing how people are getting committed to these various social media chat everyday by day, Telecom networks decided to craft out special data bundles in order to help users access their various chat apps that keeps them connected with friends and relatives. Below are the list of best and cheapest Whatsapp, facebook and twitter data bundles that works on all internet enabled phones, whether Nokia,Tecno, infinix, Gionee, Blackberry, Alcatel, itel etc. >> Before you subscribe for this one, ensure to have at least N25 airtime on your SIM. >> Then go to your message box and text WAW to 131. Immediately after that, you will receive a confirmation reply from MTN telling you the Whatsapp weekly subscription was successful. >> The subscription is valid for 7 days. >> Just as we did for weekly plan above, just go to your message box and send WAM to 131. >> The monthly subscribtion is valid for 30 days. >>To Unsubscribe from weekly Whatsapp plan, Just text NO WAW to 131. >> To unsubscribe from Monthly Whatsapp plan, send NO WAM to 131. >> Then send FBM to 131. >> Just text TWTM to 131 to subscribe. You can subscribe for etisalat whatsapp data bundle via etisalat chat pack, which was unlimited for users before and not any longer. So with chat pack, you are able to subscribe for all the social bundles like WHatsapp, Facebook messenger, Wechat and 2go. >> The price is N150, valid for 7days. >> It is a daily subscription and cost N50. >> Only monthly Airtel Whatsapp plan is available, just recharge your line with N100 and then dial *948# on your device. >> After that, you will receive a confirmation message with your 30MB. >> It is valid for 30 days. >> To check the Airtel whatsapp data plan on your phone, just dial this *123*8#. After all enquiry, it seems Glo network is yet to join suit in providing codes for social bundles subscription. But If you still have any idea about glo whatsapp subscription code, you can still let us know through the comment box. Meanwhile, we will still carry on our research and update you guy if any new development comes up. Hope you now know the specific USSD code meant for the various social media app subscription, based on the network you are using at the moment. Do you use almost all the networks listed on this post, and would want to keep record of these various codes for social bundle subscription. Then go ahead and Bookmark the page. As you can see above, among all the networks listed here, MTN Network has the best and cheapest social media data plans for all their customers, irrespective of the tariff plan you are into at the moment. For those of us that love cheat for free browsing or free access to these various chat apps, stay tuned for the one am about to release on this blog. Testing it on various networks.